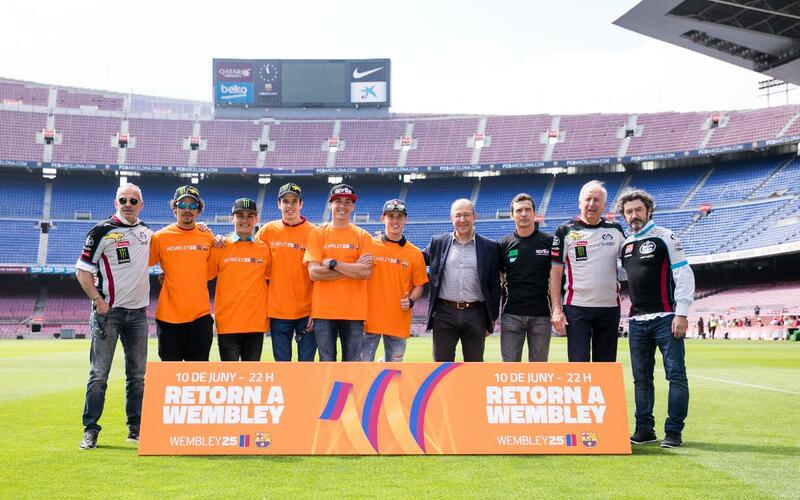 With the party to celebrate the 25th anniversary of the club’s first ever European Cup win at Wembley this weekend, coinciding with the Catalonia Moto GP, Camp Nou welcomed five Moto GP riders and some of the 1992 Barça squad. Brothers Aleix and Pol Espargaró, Àlex Márquez, Aron Canet and Franco Morbidelli visited Camp Nou and spoke with Wembley 92 assistant manager Carles Rexach, and with former players José Mari Bakero, Guillermo Amor and Julio Alberto Moreno. As representative of the Club, the meeting was also attended by vice-president of Communications and Marketing Manel Arroyo. The riders stepped out onto the Camp Nou turf donning commemorative jerseys while the ex-players wore some of the riders’ gear. Aleix Espargaró, who has always shown his admiration for Barça said that the club is a great example for all athletes: "I am very proud to be a Barça fan and the values that guide the club”. Carles Rexach is also a fan of motorcycling and, like the rest of the players, wore a rider’s jersey. The club legend exchanged opinions and experiences with the young drivers, while Bakero explained that there was a club before and after Wembley: "Johan was a visionary who numbered the positions on the pitch, and we were privileged to live in that time”.